Imagine You Get To Do What You Love Every Single Day! I work with individuals at all levels and across many sectors to help them clarify their career goals and to create clear roadmaps to achieve them. The endless juggling of your time between work and family commitments, and dealing with the associated guilt. Is what you’re doing right now aligned with who you are and where you want to be? 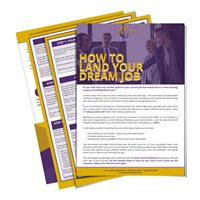 Have you considered exploring how to advance your career and land your dream job while continuing in your current role? Interview techniques and customised answers to probable personalised questions. Honing your interview skills with special emphasis on presenting yourself with impact. Joint development of your career strategy, implementation plan and revised CV. disappointed with the outcome of your last interview. It is important to reflect on your strengths, what you bring to the position and to work on how to communicate well and present yourself to best effect. preparing you in terms of your verbal and non-verbal communication skills. Align your CV with frequently used terms and key words in job advertisements. Present your qualifications and skills relative to the position you want. Develop a compelling career summary emphasizing the breadth of your experience and the value you bring to the position. Detail the results and outcomes you have achieved. Emphasize how you can help the organization, rather than what you want in a job. Structure and present it with impact and ensure correct grammar, word use and punctuation. Your CV is the first chance you get to make a good and strong impression on a potential or current employer – so you need to make it work for you! “I approached Charley to see if she would do one-to-one mentoring with me in order to dive deep with my skills for the interview. Charley has been an exceptional mentor to me. She went through each and every fine aspect starting from the job description, SWOT analysis and other details within my CV. She helped me to articulate my personal strengths and the highlights of my career in the best possible way to present during the interview. She boosted my confidence to a new level. The interview tips that she provided were extremely helpful. Having greater balance in your work and home life. And how great would it be to have a renewed sense of enthusiasm about where you are right now, knowing you won’t be there forever? Refresh and put some oomph into your CV. 30 MINUTES FREE CONSULTATION COULD BE TIME VERY WELL SPENT! SCHEDULE IT NOW!